Here we are on the 28th of our May graphics. Today’s image of Richard Armitage at the Chris Ryan’s Strike Back premiere comes to us from Teuchter. If you click and zoom in, this photo is extra large (2293 x 3140 pixels). Thank you very much, Teuchter! Teuchter’s recommended music was “Adagio” sung by Lara Fabian. 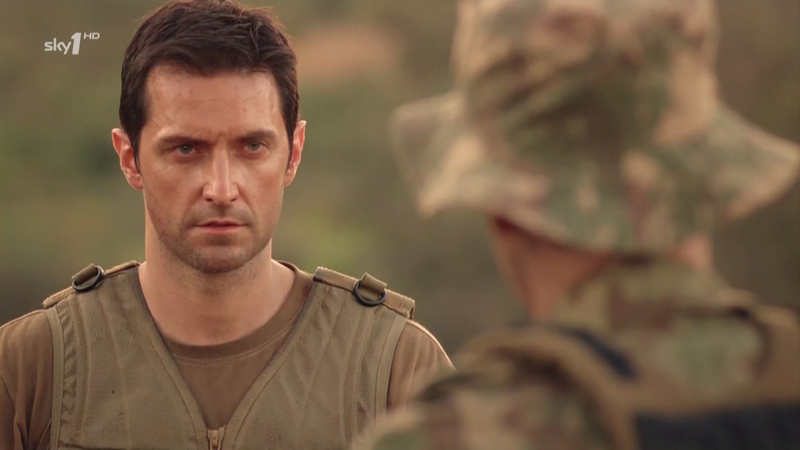 I wanted to explore the way Richard Armitage contrasted with John Porter. The word “fade” from the song lyrics kept calling to me and it was then that I had the idea of an animated fade-in of RA into JP. I next created a new file. I put each siggie in a layer and opened the Animation panel in Adobe Photoshop CS5 with the Window > Animation command and set the view to Frame Animation. Then I added Tween animation frames. Tween is short for “in between” and the software creates frames that will fade from one image to another more seamlessly. Finally, I used the File > Save for Web & Devices command to save as an animated gif. How does Richard Armitage transform himself so completely for his roles? This entry was posted in Animated GIFs, Collaborative Project, Graphics, richard armitage and tagged actor, adagio, animated gifs, chris ryan, chris ryan's strike back, graphic a day in may, graphics, john porter, lara fabian, richard armitage, richardarmitagenet, richardarmitagenet.com, richardarmitagenetdotcom, strike back. Bookmark the permalink. Excellent choice of picture, Teuchter! Wow, B, you’ve outdone yourself with this one. The two images or Richard/Porter line up just perfectly. The man brings such subtle nuances to his characters. Your graphic really shows that. Well done, you! Gorgeous man…gorgeous graphic! Thank you! Just gorgeous… How does he do it? He’s a dedicated artist, so lots of hard work and magnificent talent, of course. He walks around in the character’s skin and makes us believe. As for the quote, well, Porter has a lot of dramatic range, so the usual action-figure types would have failed. What a wonderful graphic bccmee … and you have put so much thought into it. I loved what Richard said about the character compared to himself. He always gives such depth to his characters …. probably because there is so much depth to him as a person, though he’s far to modest to say so!! Perfect for today. One of the most amazing of your May graphics. Thank you Teuchter for the photo selection and song (didn’t know there was a song to the music). I love when he talks about his characters and love your selection of what he said about himself and about Porter. How does he transform himself? From his various interviews it’s clear he first works to understands each character as a human being and not just a good or bad character, even a character that may be only a short time on screen, and that’s amazing. He was the perfect choice for Porter because he made us love the man and have sympathy for the soldier. Great choice in picture, Teuchter. The graphic came out really, really good. How does Richard transform himself? From what I’ve read about him(as well as from interviews) he puts a lot of thought and attention into who the character is, what’s important to him and how that translates to the story. He looks for the flaws in the good guys and the vulnerabilities in the bad guys. Things that make the character human and relatable, not just to the audience, but to himself as well. That’s what makes him so good at what he does. This is GENIUS! Sorry for shouting. He is a chamaeleon. How does he do it? Even his nose looks different as John Porter! Wow, great choices, Teuchter! What a beautiful rendition of Adagio. I haven’t heard of Lara Fabian before. I’m so sad May and therefore “Graphic a Day” is almost over! It’s been fun, not just for the great artwork, but also because I discovered songs I really loved and probably would not have listened to if it weren’t for this project. Gorgeous siggie, one of the best, bcc! RA may be difficult to spot in ‘real life’ as he radiates something different when in character! Thanx for another great sig B! LOL, too funny! My internet was slow to load, so when I looked at the siggie, it was just the premiere pic. I scrolled down to look at comments and when I went back up, the siggie was Porter. I was confused..Thought I was seeing things..LOL..I thought I was losing it. Then, I kept staring at it and when it finally loaded completely, I realized it was changing between the two pics! Bravo! Excellent siggie! Brilliant graphic Bccmee!!! Thank you!!! Great images and Siggie! I love the symbolism and your using Richard Armitage’s own words in the siggie. Fab! Great song and singer, too! Is John Porter the character RA felt absorbed him almost completely? It must be a little disorienting when an actor becomes the character so seamlessly. Excellent choices of photos treatments and captions. Great job! Team #28, you’ve captured the actor’s art of transformation. I’d like to be on the receiving end of his nourish and nurture. And I really, really appreciate the glimpse of chest hair. Fantastic, bccmee! I love your creativity. Great photo choice, Teuchter! *APPLAUSE* Well done again! love the transformation the graphic makes. It is quite staggering how he indeed has that ability to transform himself and “become” the character he is portraying – even in how he looks – and the above graphic is an brilliant example of that. The hair style and colour are not that different but you can see how Richard “disappears” and now he is John Porter!! It is the same in his other roles and it’s not just the hair style or colour, stubble or lack thereof, but his facial expressions, what he does with his eyes and the way he moves his body!! Talk about “body language”! I’ve read comments in various places by people who had no idea till then that the same actor who played John Thorton is also Lucas North, John Standring, John Mulligan, Paul Andrews and so on, and they are quite blown away!! Just wait till they see him as Thorin!! Thank you also for mentioning the link I put on Sunday’s Graphic of the Day to the N&S video which featured yet another of Lara Fabian’s songs. I can’t help but watch it over and over! *sigh* For those familiar with Albinoni’s “Adagio” but not the lyrics, if I’m not mistaken she wrote them! Sorry! I’ve taken way too much space already but one reason I chose Lara Fabian is because if Richard had starred in the “Charlie” movie (yet to be made I think but not with him in it) Lara was also to appear as the doctor’s wife apparently. @Teuchter: Wow, I’m overwhelmed by your kind words. Not sure if my response can do it justice. It’s an unusual image of Richard Armitage because he is looking so intently. What does he see inside us? I still don’t understand how he does transform himself so thoroughly. I completely agree that he inhabits his characters so perfectly that he becomes almost unrecognizable from role to role. When I was in the UK with a friend, I literally asked strangers on a train if they knew who that man was on the Strike Back billboards. They had no clue. And even though they’d seen Robin Hood, Spooks, the finale of The Vicar of Dibley as well as North & South, they did not realize the same actor appeared in all of those shows. Thanks for the Lara Fabian references. She is a very passionate, powerful and talented singer. I can see why she’s so popular internationally! Fantastic job,Bcc! we could see the slight change between two different countenance when the fade is running. Perfect! Thanks Teuchter for the splendid pic . Richard had said he didn´t understand why he was chosen to portray J.Porter, but we know and surely the film producers knew what they were doing, because if they had chosen an actor as many who just portray violent characters ,SB would be another series of violence like many other out there . And I have read that many people have said SB1 is much better than SB2. In other words, Richard made the difference! And what a diference! This is such an amazing graphic! You were truly inspired. @Teuchter – I agree totally with all you’ve said about how RA disappears into his roles. I don’t have enough superlatives to say how much I admire him! Great graphic!!! Well done, Bccmee!!! Nice choice, Teuchter! I’m missing this May project already. I can’t believe it’s almost the end. *sigh* well, if I must, I’ll enlarge the picture again and check it out for that little thread. Oh, how wonderful. The quote you took for your siggie, also playes a big role in how I interpret RA. I really love your siggy and the Monet-like background in contrast to the explosive John Porter- background. Sigh ;o) – Thank you, Teuchter and bccmee! Fantastic siggie…..just EXCELLENT!!!!! You’re soooo creative! I just keep staring and staring at it! Such an uber-gorgeous SB premiere photo, too! Richard Armitage sometimes makes me question my own sanity. I had to laugh when Carolyn admitted she thought she was seeing things when the animated siggie loaded so slowly. I was concerned about the file size but when I tried to reduce it, the loss of quality was too much for me to bear. But it was worth it for that story! 😀 Thanks for sharing! Again, I appreciate all your astute and sometimes funny comments. 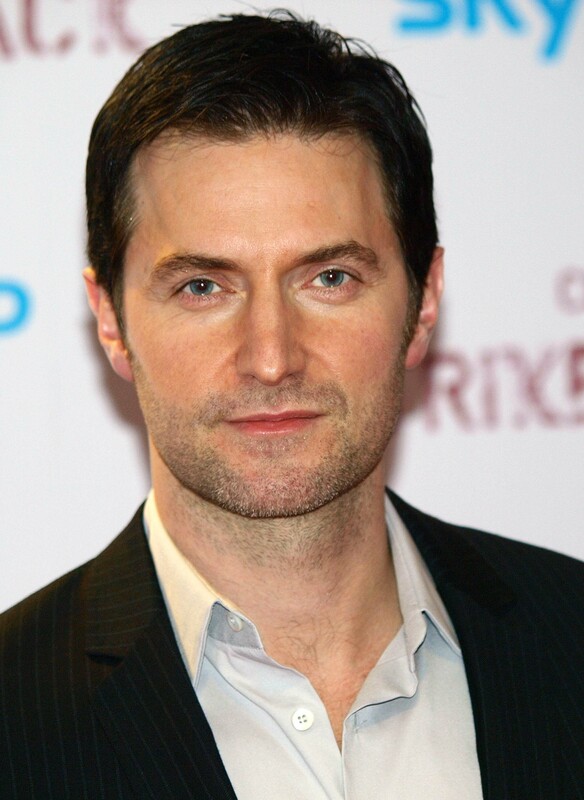 It’s a delight to hear your thoughts to help me understand Richard Armitage in new ways.